@Bowler218 Lmao it's funny cuz I'm hetero irl (straight in other words) but it's a different take on creating a card for me, and I like elves so this is cool. Does anyone find it weird that in video games, there are more physique customizations for female avatars than males? Hopefully I'll eventually get around to everyone, but I've made no promises and won't make any promises. Ha ha. When a hobby becomes a job it loses most of its entertainment for me. So I don't want to commit to anything as it creates a burden on me that can cause a lack of interest and harm my card making quality. So I don't want to run that risk. The other point of it was to also allow others to see what people post if they were curious about making a card for someone or whatnot. I'm too fickle to put a guarantee on anything. Ah! You caught me off guard, I didn't think you'd make a card for me. Thanks @Suicidal_Deity horrors are highly underrated and deserve more good cards like this one. Favorite color or color(s)? : I love black. Then red or blue. Favorite play style(s)? : I like aggressive decks. But recently I've found myself liking control decks. Having all the answers. Favorite specific card(s)? 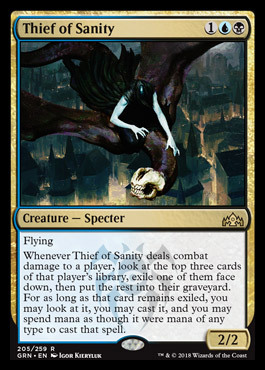 : Emrakul, the Promised End, Kozilek, the Great Distortion, Ulamog, the Ceaseless Hunger, and many more. I also like the commander format. Favorite Colors: Originally my favorite was red/black and mono green. Over the years I've loved green/white. Would splash black or blue in with commander such as blk/blu/grn or blk/wht/grn. In regards to red, I still run red/white with a splash of blue if I want to play artifact or red/wht/blu commander. Though...when I stop to think. I still go back to green/white. Favorite creatures: that's hard to decide really. I guess from my Commander Decks; Soldiers, Knights, Angels, Tokens, Elementals, Zombies, Spirits, Merfolk, Artificers, Wurms, Dinosaurs, Artifacts, Druids, Shamans, Rogues, Warriors, and Vampires. Playstyle: I'm told that I'm very methodical in my playing, no matter what color it is. Analyzing my opponent and trying to be a step ahead in some way. I run different decks with different styles based on my mood. I also try to be flexible with my decks since I try to build decks based off what I have. Example: Didn't have a deck so buddy let me build a deck with his stock of commons and uncommons, built a pure green rush deck. Played against him with it and beat his favorite black/red deck. He kept the deck and used it ><. I'm pretty passionate and friendly when I play, even if my opponent is a jerk. I even have a method of cutting cards into three or five piles and letting my opponent pick how to arrange them....they hate that method it seems. Favorite cards: Too many ><. Sorry it's hard because I developed a love for all the cards used in my decks. Will try and leave a few. Got more, but these are favorites for personal reasons I possess. Sorry for this being too much or not enough. Favourite colour or colours. Simic! Started playing: Very recently. Picked up the game when Eldritch Moon was about to be released. First FNM: Triple Amonkhet. I was a control/grindy deck player stuck in aggro hell. First pre-release: Hour of Devastation. Did well with a beatdown aggro deck in a slower format. How times change. Favourite set/block: Tough choice between Time Spiral block, Lorwyn/Shadowmoor blocks, Champions of Kamigawa, SOI block, Ixalan block, and Dominaria. I like them all! Favourite colours/playstyle: A while ago, I'd have said UW control without a doubt, but now I'm not so sure, as I enjoy playing pretty much anything as long as there is an aspect of interaction (eg: I enjoy playing Jund and even Mono Red, but for the life of me can't imagine playing Bogles or Storm). I still think UW based control is the deck I can pilot with the most skill, so I'll go for that. Especially the Miracles build. I love that one. I've also played black based control, and really like the feel of proactively stripping options from the opponent. I also have a soft spot for various forms of White aggro, with plain White weenie, Boros weenie, various D&T/hatebears builds, and Selesnya tokens decks being among my favorites. I always like having access to white due to its powerful hate cards. I like powerful answers more than powerful threats. Lastly, I have some strange love for Merfolk. Don't ask me why; I can't even swim. Favourite formats: While I largely play Standard, I consider Modern my favourite format. Standard is where I get to innovate, and Modern is where I get to play my favourite deck and tweak it. 3 copies of this is what I took down HOU prerelease with, and it was hilarious. Will never forget. That was really mind-blowing. Totally unexpected. @KalamMekhar, River of freakin' tears...! I really wish I had that card for my Scarab god edh deck omg. I'm getting geared up to make an Oona, queen of the fae edh commander deck too, so vendilion clique would be a nice addition to that deck. Brief description of myself: Hello my name is Mercy, I also go by the nickname Mercyque. I'm a believer in finding the inner good of all colors. My favorite hobbies are gaming, wardrobe making and art/music. I'm on my way through transitioning as a Woman and have finally been finding some clothes that are interesting/cool. For a card, anything that symbolizes the quote below would be the best example of a card describing myself. "I found in myself what I sought in another. Just to find a much better lover! and found who I am." Favourite colour(s): W, GW or B.
Favourite creature types: Angel, Demon, Rogue, Advisor. Favourite specific cards: For favorite cards, I'd have to go with the following legendaries for sake of finding them easier. Since I don't have a lot of playtime in MTG due to budget concerns, as I like to play Commander which can cost a lot to be viable. What are my favorite colours? I love to play blue and black, although I believe I identify with blue and red. What do I like to play? Multiplayer: Either complicated graveyard shenanigans or no win condition group hug. Kithkin, squirrels, hippos, cowards, thopters, fungus, plants, chickens, rebels, and slivers. Draft, commander, pauper, and modern. My favourite colour is probably the cliche blue (because it's the winning, not the taking part that counts). I also like white. I like goblins, and merfolk, i guess. Weirds and humans are pretty chill as well (i would love a red blue werid tribal commander). Control and combo are easily the most fun. Aggro is for mindless neanderthals (just ignore my previous comment about goblins). @KJMartin i would love to see more "Weird"s in the game, a legendary one for an izzet commander weird tribal build would be sweet. Also, i love Thragtusk comboed with conjurer's closet. I saw the card you made for saveria201 and decided to see if I'm at all inspiring! Favourite colour or colours: Black! I play every color because I love experimenting and such, especially in Commander, but black was my first love and always calls to me strongest. Favourite creature types: Spooky fellows! Zombies, skeletons, demons, horrors, nightmares, eyes (all three of them), and scarecrows! Favourite play style: I like to show off my creativity. Winning in very Johnny ways is my favorite feeling, but I can be pretty brutal when I want to tryhard. Sadistic cackles are normal for me. Favourite specific cards: Oh, far too many to list. Off the top of my head, Phyrexian Unlife and Gray Merchant of Asphodel have been faithful companions throughout the years. Sorin Markov is my favorite planeswalker. Hope this can spark something in ya! Yeah, weirds are really cool. It's a shame Melek, Izzet Paragon didn't interact with them at all, and I don't think there were any in GRN. Thragtusk is ridiculous in any flicker deck as well - he's especially fun in my Roon commander deck -- one of the only fun combos in the whole build. Everyone is inspiring, it is just a matter of when and how. You have taken the first step in aiding me though, since I do not usually create without subject. My favorite creature type is dinosaur. My favorite playstyle is aggro. My favorite card is Carnage Tyrant. Play style: Start off playing weak creatures that grow, then draw a bunch of cards and make all my creatures super big using cards like Prime Speaker Zegana (the best prime speaker) and Toothy. My favorite format is commander, which I play almost exclusively. I'll occasionally play no win-con group hug on untap too.